Textured Linen Roman shades provide a classic linen look to your windows. With features such as the uninterrupted flow of fabric from the headrail to bottom rail Textured Linen Shades, when raised keep the bottom rail hidden and will not deter from the beauty of the shade. Are these roman shades lined? They are not. They're just a light filtering fabric shade with no upgrade for a liner. The roman shades we picked out worked out really well. Great product! Had them installed two years now, and they work as good as the day I put them in. Perfect!! 2 years running, still operate beautifully, and look terrific. Great Price, easy to install. Great Price, easy to install. Love my new blinds. There were no directions for the valance and we struggled a little bit with that. There were no directions for the valance and we struggled a little bit with that. Otherwise they went up pretty quickly. The Duofold or Top Down Bottom Up upgrade is designed to maintain privacy while still allowing an outside view. Duofold allows the shades to be either lowered from the top down or raised from the bottom up. Classic tear drop roman shades incorporate the sculptural qualities of a traditional roman shade to add dimension and interest to your windows. When raised, the fabric folds gathered to the headrail. 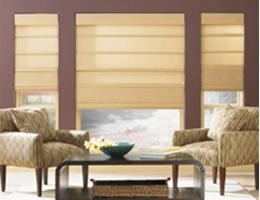 Flat Panel shades offer a tailored look. In the lowered position, the fabric hangs smoothly. When raised, the folds gather at the headrail.